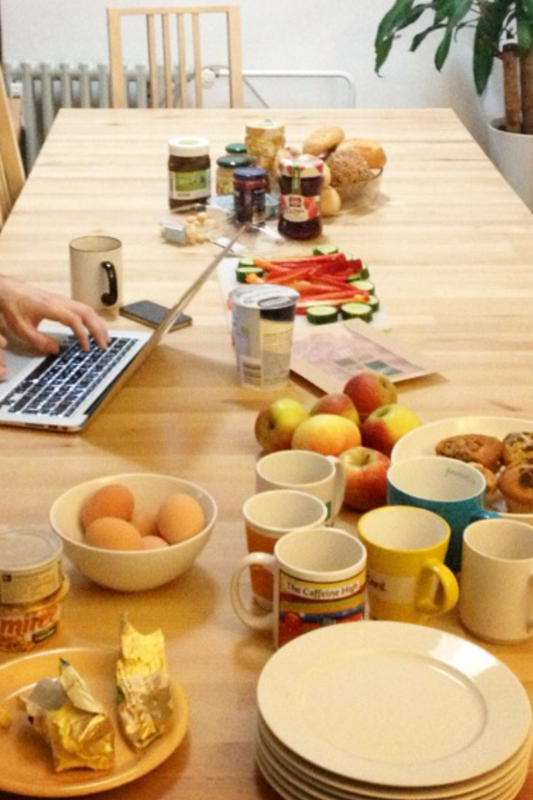 Shared breakfast at our coworking space in Berlin, co.up – a moment to get together and talk around food. The first time I heard sharing is caring, it had a strong italian accent. Some of my Erasmus friends in Prague (well, they were Erasmus, I was not) used it as kind of a group motto. It was nice to the ear and meant something beautiful, so I added it to my very own list of commandments. In this blog post I will write about what sharing is and how it affects our societies; and share with you some easy ways to share more in our ordinary life and make an impact in the world around us. Sharing has always been part of our culture (our=humans). Hunters and harvesters shared their meals, sharing bread is the main religious ritual for jews and christians, and in many cultures child raising is a shared activity among all members of the community. As we settled down and built cities and became sedentary, and with a little help from good politicians, philosophers, intellectuals and priests, sharing became something people enjoying a comfortable life were expected to do. Sharing a part of our revenues with the state to contribute to the schooling of children in poorer families, building roads for the ones who need to travel, or supporting people who lost their jobs are examples of sharing in our system. Solidarity is taught at school – share your toys with your classmates, collect food to send it to Africa. And even though we live in a strong market economy, we manage to keep the importance of sharing somewhere in our radar. The economical crisis (every black has a bit of white) has brought sharing and collaborative consumption back to the spotlight. Think AirBnB, car car-sharing companies, coworking spaces or something as mundane as shared flats. Awesome. A way to stop the over-consumption of the 90s and great for our pockets. These days, many of us are making lists of things we want to change in our lives – quit smoking, start jogging, eat healthier. Gyms owners are rubbing their hands. This year, among some other purposes, I want to share more. I commit to sharing more and buying less, to giving away more of what I have and know, and to putting more of my time in things that matter. Here are some things I want to try this year. I am not mentioning the three main areas of sharing: Living, working and moving. There are two reasons for this. One, I don’t feel like. This applies to living. I just moved alone after a couple of years of sharing flats. Everybody needs some time on their own they say. The second reason, that applies to working and living, is that I already do both. I should improve my coworking frequency, but I do great in transport. I usually walk or use public transport and just bought a new second hand bike after my old one got stolen. I don’t even have a driving licence! But if you do, consider ridesharing. That’s my big tip. Now to the little details that change the world! It’s a cup of coffee paid for in advance as an anonymous act of charity. This seems to come from Naples (Italians like to share it seems), where if someone had a reason to be grateful would pay the price of two coffees but drink only one, leaving the other for any poor person that would enquiry later, who could have it for free. I found a place in Neukölln that supports this (the german terms are schwebender Kaffee or aufgeschobener Kaffee and the place is called Café Jule) and I am going to move all the coffees I can there. January is the world’s month of de-cluttering. Why throw away your stuff, if it can be reused? Free shops receive donations from people and anyone can go there to take what they need. For free. I went to a give-away shop for the first time in my life in Berlin (here they call them Umsonstladen), and I fell in love with the concept. Waste is a huge problem and buying new stuff al the time just doesn’t make sense. Plus, it’s an easy way for people without resources to acquire what they need – clothes, stuff for the house, books… There is one in Charlottenburg but I’m sure Kreuzberg and Neukölln hide some as well. There’s this turkish market by my place (by the canal starting in Kottbusser Damm) on Fridays and Tuesdays. It has ridiculously cheap prices when it’s just about to close: The turkish men don’t want to bring the food back home as it’d be spoiled before the next market. If you go at this time, right before 6pm, you can get a box of avocados for 3 euros (yups, as bad as in any supermarket in Berlin) or a box of rucola to make pesto for two families for 1 euro. Buying all this alone doesn’t make any sense – it may not spoil in the marketers van but unless you have a huge family it will rot in your fridge. This year I want to get together with friends, shop in the market, have a glass of wine, and divide our hunt. A good thing to do after a session of ultra-collaborative shopping is go home and cook with what you bought. Cooking is a pleasant experience, and gets better around the right people. I usually make very easy meals if I just cook for myself (pasta and lettuces based dishes, eggs, avocados, canned fish and lots of tomatoes) but if I expect guests, I love spending the day in the kitchen and preparing different dishes. When friends come to help before the dinner, and bring new ingredients we find a gap for, cooking stops being a housekeeping and self-sustaining activity to be a entertainment. Sharing food, putting our ideas together to make dishes better (that little bit of rosemary that changes everything) and seating to the table to eat and drink and talk is actually my favorite thing to do with my friends (not with my Internet friends though). I want to do a helluvalot more of this in 2014 and I’m sure you can enjoy it too. What are other easy ways of sharing? Do you think the sharing economy and collaborative consumption will ever stop being a marginalized/hipsterized thing and become mainstream? Do you see any problems with these tendencies? How could they affect the future of economy?